Buchanan's car at New Smyrna earlier this year. Chuck Buchanan Jr. picked up the eighth last-place finish of his NASCAR K&N East career in Saturday’s Zombie Auto 150 at Bristol Motor Speedway when his #87 Spring Drug Chevrolet fell out with electrical problems after 19 of 150 laps. The finish, which came in his 20th series start, was his first since September 4th, 2017, at Hampton, four races ago. Buchanan has been a perennial underdog in NASCAR. He and his family team have run a partial K&N East schedule since 2011, when Buchanan made his debut at Greenville-Pickens Speedway. In the 19 starts since, he has finished nine of them, and in all of his starts, he has carried funding from Spring Drug, a drugstore mere miles from the Wood Brothers’ former base in Stuart, Virginia. Buchanan has also been trying to make his NASCAR Camping World Truck Series debut for five years. Some previously garnered LASTCAR coverage, from a brief mention for his first attempt in the fall of 2014 to being a part of a lengthy list of DNQs in spring of 2017, both times at Martinsville. In fact, all but one of his six attempts to qualify have come at Martinsville, the one outlier coming at Bristol. Unfortunately, all have resulted in four DNQs, in which he was never above 35th in time trials, and two withdrawals. 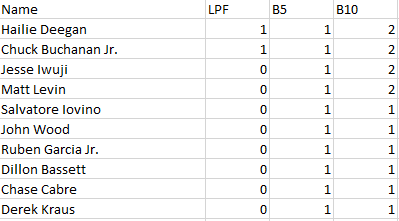 For 2018, Buchanan switched from his usual K&N number, 19, to the number he had used in all of his Truck attempts (minus one for Jennifer Jo Cobb in 2017), 87. The #19 went to Bill McAnally Racing, which expanded its K&N East effort to three cars. At least for the first two races of the 2018 season, McAnally's #19 has been driven by Hailie Deegan. The initial entry list at Bristol included 29 drivers. Aside from Jimmy Zacharaias, whose #31 Marsh Racing car withdrew, all entries made the race. In first practice, Buchanan anchored the speed charts with a lap of 17.664, about a tenth off the next driver, Salvatore Iovino, and just about two seconds off of pace setter Harrison Burton. Starting last on Saturday was Chase Cabre, whose #4 Rev Racing team was the only one to not record a time in qualifying after he crashed on his attempt. 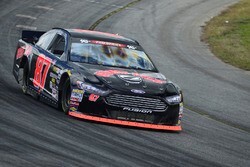 Buchanan was the slowest car on time, running an 18.603, a half a second off the fastest car and three and a half off of Noah Gragson, the top qualifier. Interestingly enough, the next-fastest car on time, Anthony Alfredo, hit the wall off Turn 4 and still recorded a lap faster than Buchanan. Alfredo would start 26th but have good help moving up, as his spotter Landon Huffman spotted Zane Smith to an ARCA win last week. Cabre fired off last, but would not remain there for long. Buchanan took last soon after, eight seconds down after one lap. He would soon surrender the spot to Brandon Oakley, who inherited the spot after a spin on Lap 4. After the ensuing round of pit stops, Cabre found last once more, only to vacate the spot on the restart and hand it to Salvatore Iovino, running his first full East slate this year. Buchanan, running on the same lap as Iovino, retired around Lap 18, though the exact lap is hard to tell because he was laps down when he retired. The decision to retire may have been influenced by a poor-handling car, as he almost turned Noah Gragson while getting lapped. 27th went to Jesse Iwuji, who was the victim of a spin on the backstretch that resulted in Tyler Dippel being called to the NASCAR hauler at the conclusion of the event. Chase Cabre wound up 26th, his awful weekend capped off by a terminal electrical issue a third of the way through the race. Matt Levin took 25th after an accident that did not draw a caution. Rounding out the Bottom Five was Derek Kraus, who encountered multiple issues throughout the day to finish under power 21 laps down.